I've had a really annoying and inconvenient problem in the last couple of weeks, in that I haven't been able to hear all that well. Felt like my ears were totally filled up. To compensate I did a lot of nodding and smiling. My friends laughed at me because I was whispering a lot. "Why are you whispering?" they asked. "It seems like I might be talking really LOUD," I explained. Since I wasn't sick and the ears didn't hurt, I figured my problem was ear wax. So, I tried some at home remedies. I put drops of olive oil in there and massaged them. I bought a little lasso-like pick designed not to go too deep into the ear canal. With that thingy, I extracted some pretty satisfying chunks of wax. Reddish and extra sticky. Still, I couldn't really hear. Next step was the drops you put in there and then irrigate with a squeezy bulb. Did that yesterday. Still, I woke up this morning underwater. Nothing left to do but go to Target Clinic. "Your ears are filled with ear wax," the friendly M.D. reported. Then, he held up a spray bottle with a long nozzle. "This will be high pressure water. It won't be comfortable." "No problem," I said. "I have a really high pain tolerance." "Good," he said, and had me hold a little basin under my ear. Then he squeezed the ENTIRE bottle, like a whole QUART, into my ear. I asked to see the chunks of wax floating in the run off bin. "Yuck!" I said. He did that again in the left. Then, he moved over to the right. "This one's extra packed," he said stoically and starting spraying. The debris was impressive. "Doesn't everyone want to see the results?" I asked when I once again craned my neck to peer into the bin. "That's surprising," I said. "I'm really interested in seeing it." "I can tell," he said. 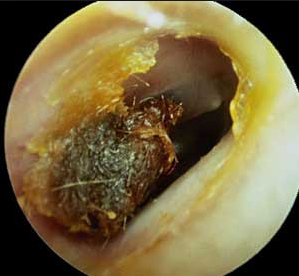 He peered into my ear with the otoscope and announced that I still had a really hard chunk in there. "OH NASTY!" I said appreciatively. And, now I can hear again. Ewwww... I would have wanted to see too! Yeah, I would have wanted to see it as well. And I'm glad for the visual here. My ear I think is getting better with the garlic ear spray. It doesn't feel as annoying, at any rate. Good job taking care of your ear. Ears are awesome. It looks like a giant hair ball. DISGUSTING.